Last week, the US House of Representatives' Appropriations Committee held an otherwise unremarkable budget hearing on the judiciary. The hearing was recorded and streamed live and then released on YouTube as well as Ustream. However, this morning, Steve Schultze, who works on internet freedom for the State Department (and who has previously done great work at Princeton's tech policy think tank and Harvard's Berkman Center), went to check out the video on YouTube and saw the following. As you can see, the video was taken down from YouTube, with an apparent copyright claim... from Telemundo and Univision, the two famous Spanish-language broadcasters. Telemundo, of course, is owned by NBCUniversal, which has a long history of over-aggressive positions on copyright law. It is difficult to see how anything in a US Congressional appropriation committee hearing on the budget of the US court system would likely infringe on the copyrights of these two television stations. It seems likely that there was some sort of mess up involving YouTube's ContentID. Yet, once again, we see how an overaggressive copyright system, combined with automated tools like ContentID can lead to censorship of content that is in the public interest. Soon after Schultze pointed this out, the message on the video's page switched from being a copyright claim to that the video had been made "private." So, it's likely this is in the process of being sorted out. And, yes, in the long run, it seems unlikely that a random House Appropriations Committee hearing on the court system's budget is so important that it needs to be available immediately. But just the fact that a questionable copyright claim, combined with an automatic takedown system appears to be making information disappear from public hearings in the US Congress should raise alarm bells. Why should it raise any bells? The 4th is being stomped every second, 2nd amendment rights have been under assault for a long time, the NSA has been slowly but surely taking over the country as the man behind the curtain. Illegals are flooding into our nation at a rate so fast they are leaving their children behind. More darkness to come before anyone even catches a glimpse of the light. No one cares, because if they did, we might see a million man march on Washington... but no one cares. Re: Why should it raise any bells? Illegals are flooding into our nation at a rate so fast they are leaving their children behind. I'm with you on the rest. What copyright? Neither Telemundo nor Univision created this work (though they may have funded one or more of the members of the committee and/or presenters), where do they get off claiming copyright? Was there some background music that they might own? Some Mariachi music during a Congressional hearing? Simplest thing Congress could do is to put some teeth behind that claim that the take down claimant owns or controls the copyright. I think loss of teeth and a partial dismemberment might be a bit soft though. If I had to guess, the logic was probably that since some of their 'employees' were in the video, it means they had the copyright over it. Given how the copyright maximalists normally think, the thought process was probably more like "It's a video, we make videos, so we own this!" Thats right, I forgot about the precedent set by Judge Kozinski. Silly me. "Neither Telemundo nor Univision created this work"
Doesn't matter to them. While they face no real recourse for false claims, they are free to attack anything they see fit to attack, no matter how baseless the claims. Of course, there's also the possibility that this is simply a false positive in the ContentID system - an inevitability, but one that tends to get ignored when it's not studio product being affected. It's wishful thinking, but some people might take more notice when things like this happen rather than independent or amateur content being blocked in favour of the cartels. Proof that the rich and corporations own our government! You see, this is why people say that the rich and big corporations own our government! How can they own the copyright to government hearings if they don't own the government to? But, you know, whatever. There is no punishment, so why not trying a grab to copyright for themselves US Government publications. If it doesn't work and you get caught, later you just say "Oops, my bad" and nothing else happens. Maybe NBCUniversal should just take over the NSA and run it privately. After all,t hent hey can copyright all the metadata. After all, it's a creative output, right? Right? what happens when someone "oopsies" on their promo stuff on YouTube claiming accidental copyright infringement. Like...say....you have a collection of 3 second video of someones dancing...which just happens to look like a promo video that they put online. or - when a bunch of neighborhood kids get together to sing - and post on their private website. can they get a takedown of The Voice? that would be fun! YouTube REALLY needs to start penalizing violators. For instance: after a few false hits, number to be determined, the creator gets 24 hour notice prior to your take-down going into affect. If you still get too many false claims you go back to the old system, you have to file a formal DMCA notice. I know it sounds naive but they should be doing Something. accountability for ones actions? perish the thought. Copyright holder loses copyright to work they claimed was infringed, and it is immediately moved to public domain, with absolutely no method to get it back, ever. Even better after 3 strikes/5 strikes, copyright holder loses all copyrights, all work in their possession enters the public domain, and they are forbidden from taking new copyrights until they sit through an hour long web-based course on proper copyright etiquette made by the Open Source community. Kind of like a reverse "bad-uploaders" Content-ID system. Hey, it works for the copyright maximalists, should work fine against them too. ContentID is an extralegal agreement between YouTube and rightsholders. DMCA takedown notices are not necessarily involved. Don't confuse a contentid auto takedown mistake with a false takedown request. The law should more severely punish false takedown requests. but if someone uses contentID to claim privileges on something they don't 'own' what's the difference? They are still falsely requesting that content be removed and the law is very one sided on this, favoring IP privilege holders. ContentID is just a means to make it easier for Youtube to handle what the law does require by trying to reduce the number of takedown requests that they must process and deal with manually. The law may not require ContentID directly but it does encourage it and ContentID is just a way to automate what the law requires and make it more efficient. The law should more easily and severely punish those that use ContentID to make false takedown requests. Or maybe the DMCA must be sent via snail mail and be signed by a real person and that individual is accountable for any false takedowns, this would do a number of things that would fix the DMCA. Actually is not a legal case to ask for dmca's to be sent via snail mail? Maybe Google should do this, I am sure that the people sending DMCA's will not like paying the cost of posting individual takedowns and having to pay 50c per DMCA. Damn Google could insist on each DMCA being sent separately for ease of takedowns being processed. Then suddenly 6 million requests costs them(copyright czars) 3 million, but if they really believe it results in more income then they should be more than prepared to pay this plus the salary of those filling out the forms by hand. Same logic involving that dancing baby and that Prince song...or was it Happy Birthday? Who would I rather have Google disappear? HIT THEM IN THE WALLET ! Charge the filer of the challenge to content a nominal fee for "filing" expenses and then if the takedown is legitimate the filer gets the "filing fee" returned. If the takedown is total rat crap as most of them seem to be then the "filing fee" stays with the company or better yet, gets paid to the offended party whose content was challenged! THAT would put a quick stop to most of this nonsense! Re: HIT THEM IN THE WALLET ! That modest fee would need to be more than modest and only a percentage would be returned because it costs money to handle money. All those pesky accounting rules. A more suitable punishment is outlined above. Go ahead, make your claim, but be damned sure your claim is valid. If it isn't, you lose your copyright to the work you claimed was infringed and it gets placed in the public domain instantly. Re: Re: HIT THEM IN THE WALLET ! Damn, that's a good idea, Digger! Let's do that. That is a great idea, especially if it was applied to ALL videos uploaded to YT. I would suggest that the ratio of malicious / erroneous claims of ownership by Corporations is itsy-bitsy teeny-weeny in comparison to the perjurous / erroneous claims of ownership by uploaders. das ist verboten ! ! ! Couple of laser guided munitions and *boom*, problem solved. Youtube's Content ID system probably flagged it. I doubt Telemundo or Univision requested a takedown. I was able to view the video on two different platforms. 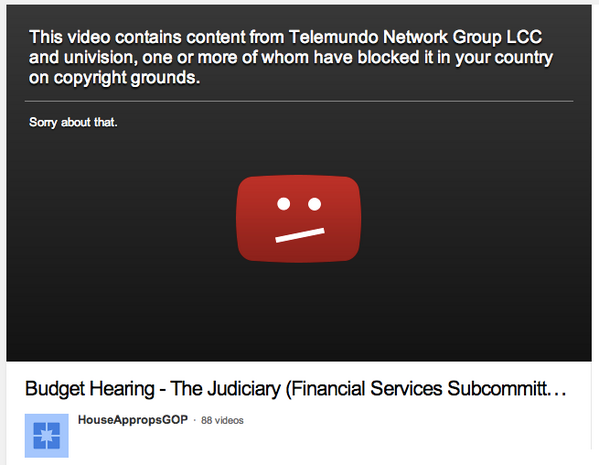 Any other channel submitting bogus claims about public domain government video would see their channel taken down. A class action lawsuit against NBCUniversal and Univsion is in order.